Fashion historian Colin McDowell states in a SHOWstudio head-to-head panel with Mimma Viglezio that if you got rid of the other fashion weeks you’d still have Paris. Controversial, one might say; truthful, others. Without New York there would be the loss of Marc Jacobs’ showmanship; subtracting London would equate to not being able to get a glimpse at future talents; the lack of Prada, Michele’s Gucci, and Marni in Milan would be crippling; and then there’s Paris. The large conglomerates and the French capital’s new wave of designers populate the official schedule. The four days of PFW provided season-best collections—there was Aalto, Jacquemus, Koché, Margiela and Dries, Rick Owens and Loewe. Yesterday morning, in my opinion, showed two of the best collections of the season. Junya Watanabe and Haider Ackermann. If there wasn’t New York, London and Milan, and just Paris: I’d be extremely satisfied with just seeing those two collections. Overnight, snow fell and then came the rain. The fashion pack can’t seem to catch a break with the weather all season. Snow and ice in New York, occasional burst of rain in London, rain in Milan, and snow and rain in Paris. Talk of weather is completely irrelevant when you take your perch for an incredibly strong Junya Watanabe collection. 38 looks, all with geometric prowess were shown. The opening look was a black top and a neoprene, structured skirt. There were hexagons, folded conic shapes, 3-D carvings, squares, ellipses and circular cutouts. A refresh of high school geometry, Watanabe’s take on the maths division was indefinitely more stylish and fashion forward. A number of seasons ago, Watanabe created magnificent honeycomb-esqe shapes. It was his best collection. This topped that. 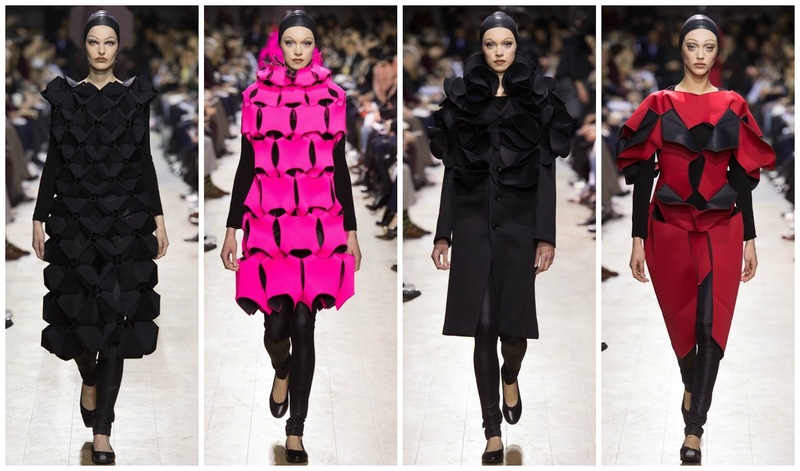 The layering of perfectly cut geometric shapes in bold hues of red and hot pink was innovation at its best. And there was a commercial offering amidst the offering. Triangular pieces were spliced together to make fabulous capes and gorgeous jackets. Pleated skirts added another dimension to the monochromatic looks. Editorially, the majority of the garments will work wonders. Put them in any spread this fall and they will enliven any page. Construction is Watanabe’s forte. Just take a look at a neoprene biker jacket—it’s sleeves were replaced by structured, circular panelling—or a tank dress with brushstroke-like 3-D pleating. Innovation is the keyword here. But more importantly: creativity. This precisely exacted artistic wizardry easily combated the deluge of normcore at fashion week. Haider Ackermann’s design aesthetic could be described as subverted psychedelic glam-rock. I didn’t love last season but I’ll do nothing but wax lyrical about this collection for months. The Colombian designer sent out a neatly edited medley of 32 looks, early morning following the Junya show. Monochromatic looks at Junya were a stark contrast to the palatable clash of colours at Haider. It was about “happiness.” The world is in a dark place and Ackermann doesn’t want sullenness anymore. Ackermann’s constant reinvention of the wardrobe classic, the blazer, is similar to Karl Lagerfeld’s boucle suit at Chanel. In a fiery crimson, and with black piping, Mica Arganaraz casually strolled the carpeted catwalk with matching trousers and black boots. The blazer received the most attention. Edie Campbell in bottle green velvet, with artful twine in her hair, looked like a bell boy from the luxurious competitor of the Grand Budapest Hotel. Velvet can be antiquated in certain contexts. Luckily, Ackermann tackles it with finesse. Trousers, jackets, gowns: the love affair with velvet will reignite. Ackermann’s constant meditation on glamour is one of the best things in fashion. Yes, unless you have a sharp eye his collections are majorly indistinguishable from the last—with exceptions. There’s a level of sexiness present in every collection. There was a slouchy parka tucked into skinny trousers, exposing a sliver of skin. Gowns and skirts revealed entire legs. Front row sat Kelly Rowland, Ciara and Janet Jackson. A triumvirate of singing talents who embody the powerful sexiness of the Haider Ackermann label. Take your pick, you’d look great in everything.